Maudeline Orelien, 22, with her son, Wilguens Pierre, who was born in July with microcephaly. "There&apos;s no reason to believe that the mosquito will behave differently here [in Haiti] than in the Dominican Republic," says Dr. Jean Luc Poncelet, the World Health Organization&apos;s representative in Port-au-Prince. Poncelet says part of the problem is that the country doesn&apos;t have the resources to test extensively for Zika. Haiti is also in the midst of a political crisis that has left it without an elected government since February. And it faces numerous other health issues, including a cholera outbreak that has sickened 25,000 people this year alone. Doctors at public, private and religious hospitals say they&apos;re seeing an increase in babies born with microcephaly — a condition that the World Health Organization has linked to Zika — as well as a spike in Guillain-Barre syndrome, a condition that can spring from Zika. Haiti has few services for people with disabilities so it&apos;s unclear how the country will be able to cope with a surge in severely disabled children. At the Mirebalais Hospital in Haiti&apos;s central plateau, doctors say they&apos;ve had four babies born this year with microcephaly — three of them in July. Dr. Ivers and Dr. Roman Jean-Louis are tracking the development of the children. Ivers checks the reflexes of a girl named Chinashama, who is on the examining table. "So this baby is much more muscle-toned than the other [microcephalic] babies," she says. "She&apos;s sort of fighting me, and the other really was not doing that much. But the girl&apos;s legs cross unnaturally at the shins, and one foot doesn&apos;t respond when Ivers runs her finger over the sole. The baby&apos;s mother says the child cries almost all the time. Life is already tough in the poorest country in the Western Hemisphere. Sixty percent of the population lives on less than $2 per day, and there are few services for children with physical and neurological disabilities. One resource is the Kay St. Germaine rehabilitation center in the Tabarre section of Port-au-Prince. "Here we have the resource room," Johansson says as she walks through the compound. "And a speech and language therapy room. But at the moment we don&apos;t have any trained speech and language therapists." "Because they [the parents] need to be able to change them, dress them, feed them in a safe manner," she says. "We don&apos;t have the equipment that you have in America or Europe. We can&apos;t give them feeding tubes, so it&apos;s really important that they know how to handle their kids, position them the best way possible." Most of the families that bring their children to the center live in the poor sections of Port-au-Prince, with as many as four or five people in a one-room shack. The houses often aren&apos;t accessible by paved roads or sidewalks, so they aren&apos;t accessible to wheelchairs. "So we can&apos;t provide them chairs," Johansson says. "Well, first of all we don&apos;t have any chairs. Second of all, they don&apos;t have room for chairs or they don&apos;t have anywhere to store them indoors." 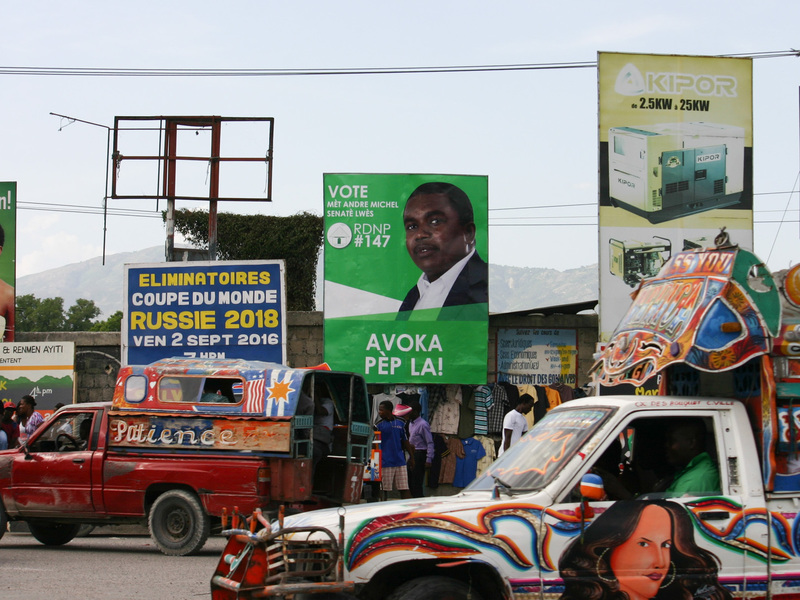 Many of the parents bring their children to the center in the beat-up pickup truck taxis known as tap-taps that barrel across Port-au-Prince and serve as Haiti&apos;s main form of public transportation. "I don&apos;t know if you&apos;ve seen the tap-taps and how full they are," she says. "And then imagine you&apos;re going to try to get a disabled child into this." She shakes her head as if the very thought of it is overwhelming. Just up the dusty dirt road from Kay St. Germaine is the St. Damien children&apos;s hospital. It&apos;s run by the same Catholic organization that runs the rehab center. The hospital administrator, Jacqueline Gautier, says disability is the leading reason children are abandoned in Haiti. "Many times the parents just leave them," she says. "Actually we have [a] room full of 10 children like that. And all hospitals have a small unit with abandoned children." She can usually find homes for able-bodied kids, but the disabled children will most likely stay at the hospital for the rest of their lives. Her hospital has also had three babies born recently with microcephaly. They&apos;ve sent blood samples to the national laboratory to test for Zika but haven&apos;t yet gotten any results back. "It&apos;s very hard," she says. "The last one is still hospitalized, because the mother died. The father lives elsewhere now. The baby has seizures, so the baby is still with us." She&apos;s hoping Haiti will be spared from Zika, that maybe it won&apos;t be as bad here as in some other places. But she shrugs and says they&apos;ll just have to wait and see.